The annual extravaganza is held in paradise at Descanso Beach Club with everything you need to enjoy the weekend: fabulous food, fine wine, classy cocktails, live music, DJs and dancing. All you need to do is BYBF – bring your best friend! 1. For the love of Step Brothers – what better way to kick off this marvelous weekend than with a screening of the movie in the historic Avalon Theater? Not only can you enjoy this hysterical film with other super fans, but you can also step back in time to experience a lovely art deco theater built in 1929. 2. There will be wine – enough said. Whether you prefer red or white, you’re bound to find a local winery here that tickles your taste buds. If wine isn’t your thing, not to worry; there will also be beer onsite as well! 3. You can be as classy as you want to be – take part in a VIP wine pairing lunch at Catherine’s Terrace or take a picnic blanket to enjoy wine tastings on the Descanso Beach Club lawn. However you like to party is completely up to you. 4. There’s just something invigorating about live music; it tickles the soul. Come see live music from local bands like the Tijuana Dogs, The Side Deal and….drum roll please, The Dan Band! If you don’t think you know The Dan Band, think again. You’ve probably seen them on various late-night talk shows or in other comedies like Old School or The Hangover where they’ve covered pop songs originally performed by female artists. 5. Dancing – with live music usually comes sweet, sweet dance moves! Rather than dancing the night away in a stuffy club, come work your rhythm outside under the sun, overlooking the beautiful beach. Even if you don’t like to shake your groove thing, doesn’t mean it’s not fun to watch others do it. 6. You can let your inner artist shine – what better place to be inspired and participate in a painting workshop than on an island with the ocean breeze in your hair and a glass of pinot in hand? 7. There’s going to be a tie-dye t-shirt booth. If you don’t feel like you have the skills to pick up a paintbrush, then you can still work your artistic magic on this groovy, colorful DIY project. 8. Outrigger Canoe Races are calling – this is where friendly competition meets island exercise. To break up your lazy day on the beach, team up with your friends, or even some total strangers, to paddle out into Descanso Cove for a refreshing work out. 9. Bloody Mary Bar & Bottomless Mimosas – the last day of the Wine Mixer is Sunday Funday, so it’s quite fitting to end the weekend with a build-your-own Bloody Mary Bar at Descanso Beach Club and Bottomless Mimosa Brunch at Avalon Grille. 10. 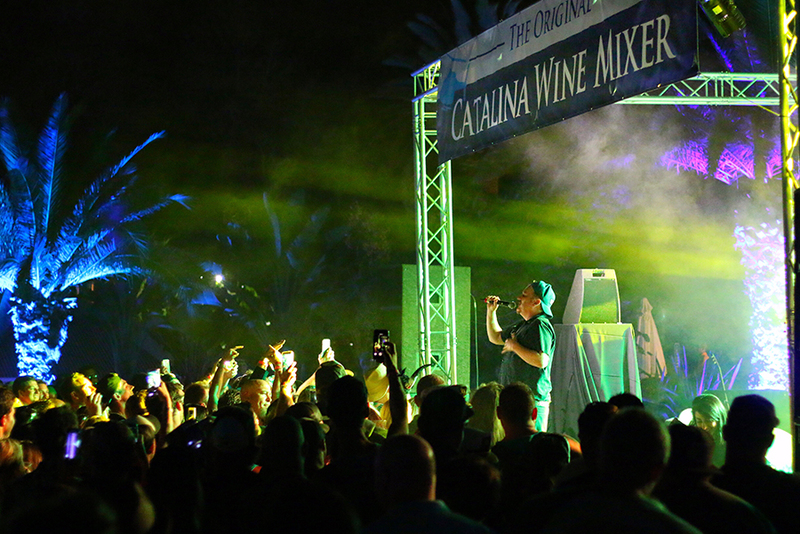 For friendship – If you’ve ever met someone new and thought (or preferably said out loud) “Did we just become best friends?”, then as friends, you owe it to each other to celebrate your friendship at the Catalina Wine Mixer. For more information and to purchase tickets to the Catalina Wine Mixer, visit the Catalina Island Company’s website.